What’s the Arctic Doing to Midlatitude Weather, and Vice Versa? 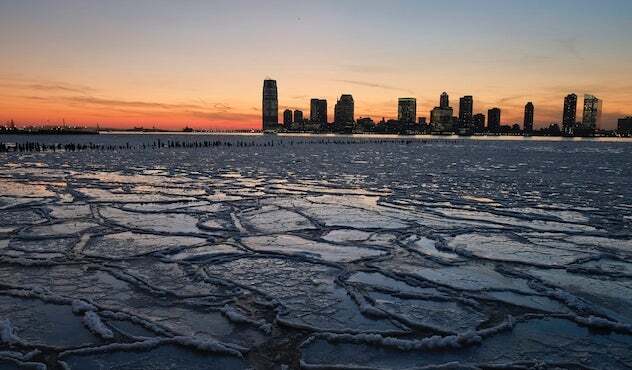 Above: Ice floes fill the Hudson River as the New Jersey waterfront is seen during sunset on January 9, 2014, in New York City. Two days earlier, the city set an all-time peak in demand for energy during wintertime, as temperatures dipped to 4°F and stayed below freezing for three days. Image credit: Afton Almaraz/Getty Images. 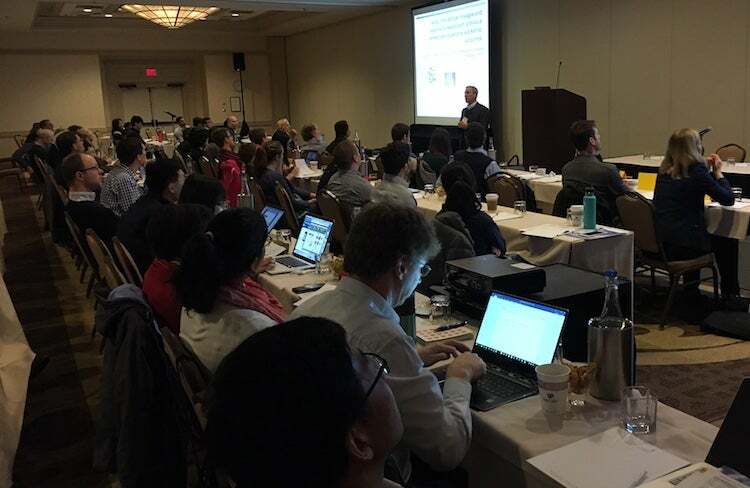 There have now been dozens of papers exploring the topic of Arctic-midlatitude linkage, and February’s workshop was the largest meeting yet dedicated to the subject. All this has led to some tantalizing results, plenty of debate, and a growing sense that research needs to be more coordinated and targeted in order to figure out just what’s going on. The workshop’s lead organizers were Judah Cohen (Atmospheric and Environmental Research, or AER) and Xiangdong Zhang (University of Alaska Fairbanks). 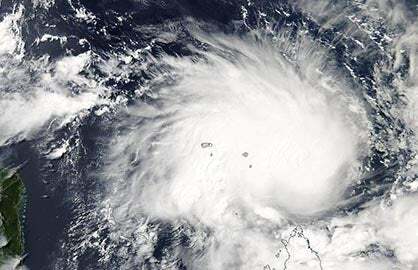 Sponsors included the World Meteorological Organization as well as the four agencies (NOAA, NASA, NSF, and DOE) that participate in the the U.S. project office for the international CLIVAR (Climate Variability and Predictability Program. The US CLIVAR office is operated by the University Corporation for Atmospheric Research. Figure 1. Participants at the CLIVAR workshop on Arctic-midlatitude interactions kick off the first morning of sessions on February 1, 2017. Image credit: Bob Henson. One thing that’s clear from the meeting is that Arctic-midlatitude linkage is no longer a topic easily dismissed, if indeed it ever was. As human-produced greenhouse gases heat up the planet, high latitudes have been warming more than twice as quickly than midlatitudes and the tropics. 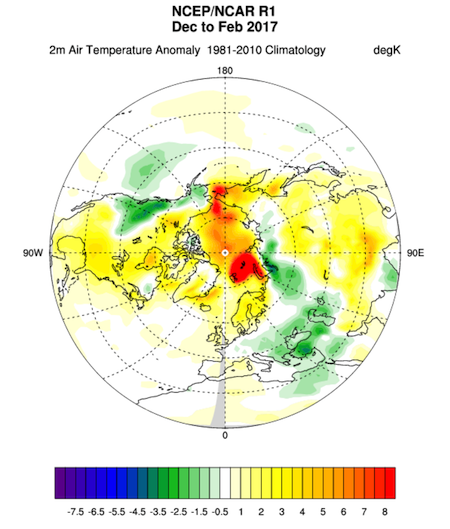 This phenomenon, known as Arctic amplification (AA), has been well predicted by models. There’s also been a dramatic decrease in sea ice extent across the Arctic, with the peak loss areas shifting in location from winter to winter but often showing up in the seas north of Eurasia, including the Barents and Kara. These trends were more obvious than ever this past winter, as Arctic surface temperatures smashed records and sea ice extent hit its lowest yearly maximum on record. But do scientists have a solid handle on how AA itself operates? That’s one of several basic questions that made their way into the workshop discussion. After all, heat can get into the Arctic atmosphere in a variety of ways. This includes the poleward motion of decaying tropical cyclones, as well as the northward swings of mature midlatitude winter storms (we saw several vivid examples this past winter). Another heat source lies below: the increasing areas of open ocean that now go uncovered by sea ice during much of the polar winter. It now appears that most of the winter warming of surface air north of 70°N since the 1990s has been from downward infrared radiation, the result of large-scale circulation changes that are pumping more heat and moisture from midlatitudes into the high Arctic. New research along these lines was published early this year in the Journal of Climate by Tingting Gong (Chinese Academy of Sciences) and workshop attendees Steven Feldstein and Sukyoung Lee (both from Pennsylvania State University). 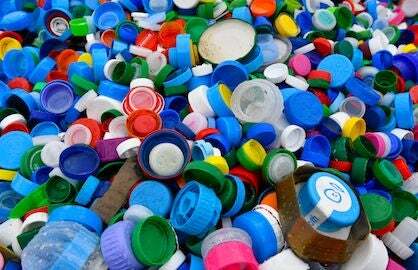 This and other recent studies raise questions about causality that will take time to sort out. Climate models haven’t yet settled on a consistent effect from the depleted sea ice on midlatitude winter climate. Some modeling work, including a paper coauthored by Screen last year, indicates that the cold blasts plunging into midlatitudes will become less severe over time because the air they bring from the poles won’t be as cold. But one factor in the less-than-consistent results is that models vary in how well they handle the difficult task of capturing sea ice as it evolves over a winter and from year to year. The CLIVAR workshop summary strongly recommends constructing an improved set of sea-ice analyses, as well as coordinated modeling studies that examine the effect of sea ice on climate more comprehensively. Cohen, for one, is banking on the existence of a particular sea-ice effect that he’s studied for more than a decade. He’s based a series of long-range winter outlooks on the idea that autumn sea ice loss in the Barents and Kara Seas leads to a more extensive early snowpack and a stronger, northwestward-displaced surface high in Siberia. In Cohen’s chain of events, this is followed by disruptions in low-level flow that propagate upward, a more variable stratospheric polar vortex, and a higher risk of midlatitude cold intrusions by winter. Figure 2. 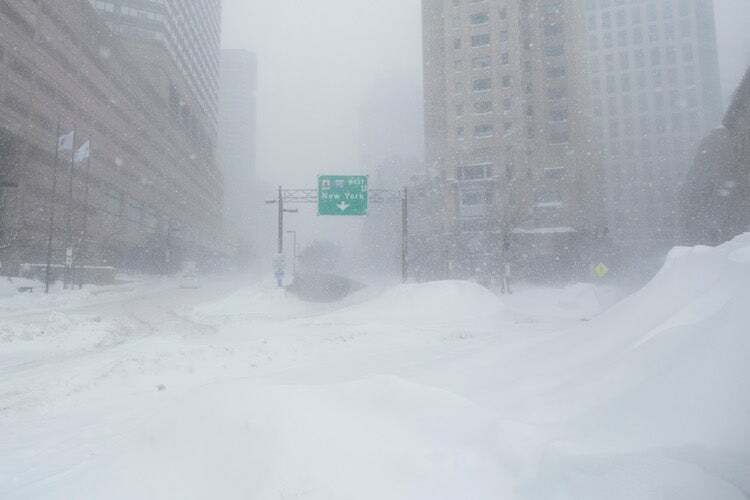 A highway entrance in downtown Boston, Mass., is blurred by snow on February 15, 2015, during the winter storm dubbed Neptune by The Weather Channel. The Feb. 14-15 storm dropped 16.2” of snow, which helped push Boston toward its all-time monthly record of 64.8”. Image credit: Scott Eisen/Getty Images. The work of both Cohen and Francis rose to prominence in the early and mid-2010s, a time when large chunks of the Northern Hemisphere dealt with intense bouts of frigid, snowy winter weather that were seemingly at odds with the global trend toward warmer temperatures. “Polar vortex” onslaughts in eastern North America grabbed plenty of U.S. attention—such as in 2014, when the Midwest had one of its ten coldest winters on record, and in 2015, when Boston smashed its all-time snowfall records for any month (in February) and for any winter. These high-profile events have been counterbalanced over eastern North America by some very mild winter periods, including dramatic “warm waves” in March 2012, December 2015, and February 2017. Do these all cancel each other? Not completely, it turns out. Climate models agree that nearly all parts of the globe should experience some warming in each of the four seasons as the planet continues to warm. In fact, we’re already seeing rising average temperatures in all four seasons, across nearly all the globe. There is one glaring exception, though: wintertime in the northern midlatitude continents, especially Eurasia. 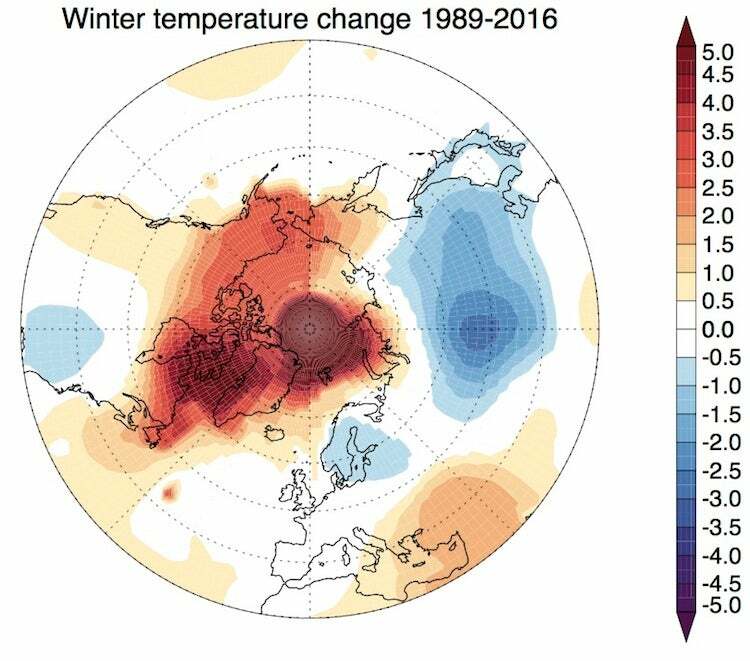 As noted in Screen’s recent article, there was actually slight winter cooling from 1989 to 2016 across the southeast U.S. and northern Europe, and more pronounced winter cooling over northern China and most of Russia. The pattern has been so prominent in recent years that it earned a name: “warm Arctic, cold continents.” It’s an outcome largely unforeseen by climate models and unexplained by climate change theory. Is this just a natural variation that will soon pass, or is it related to Arctic amplification—or to something else? Figure 3. Surface temperatures during winter (Dec – Feb) showed an increasing trend across the Arctic Ocean and most of Canada from 1989 to 2016, but they dropped markedly across most of northern Asia, with minor decreases over the southeast U.S. and northern Europe. Image credit: Courtesy James Screen, adapted from “Far-flung effects of Arctic warming,” Nature Geoscience, published online March 20, 2017. The long-term winter cooling trend in and near Siberia lends some support to Cohen’s theory. However, his 2016-17 forecast of a cold winter in eastern North America got thrown for a loop. There was plenty of open water in the Barents and Kara Seas, and we saw “textbook examples” of the expected stronger Siberian surface high and disrupted polar vortex, according to Cohen. But this time, he says, the whole cycle played out far more quickly than usual—before the end of December. Meanwhile, cold air streaming eastward off the widespread snowpack in Siberia helped chill the waters of the North Pacific, home to the “ridiculously resilient ridge” of the early and mid-2010s. The result was a winter much different than those we’ve gotten used to. Figure 4. Surface temperatures from Dec. 2016 through Feb. 2017 ran counter to the trend of recent years across most of Asia, southeast Europe, the U.S. Pacific Northwest, and western Canada. In all these areas, cooler-than-average readings prevailed. Over most of Asia, readings averaged warmer than normal, again contrary to the trend in recent years. More consistent with recent trends was the relatively cool air across northwest Asia and widespread warmth across the Arctic. Image credit: NOAA Earth System Research Laboratory. Elizabeth Barnes (Colorado State University) is among those researchers who argue that a robust effect of Arctic amplification on midlatitude weather has not yet been observed. Her work, including a 2013 paper, has found little evidence that large-scale ridges are becoming slower or more amplified as our climate warms. This suggests that midlatitude weather weirding may have a large share of natural variability. Methodology makes a difference here, as there is no single benchmark technique for measuring such things as the duration and amplitude of ridges or the irregularity of jet streams. At the Postdam Institute for Climate Impact Research, Giorgia Di Capua and Dim Coumou have been exploring a new “meandering index” that’s found some noteworthy changes in jet-stream behavior, especially during autumn across Eurasia. Meanwhile, Stephen Vavrus (University of Wisconsin-Madison) and Julien Catteaux (CNRS/Meteo-France), among others, have been looking at the sinuosity of the jet stream. One way to measure sinuosity is by evaluating how much area is enclosed by a latitude line and the jet-stream departure north or south of it. Barnes wasn’t at the CLIVAR workshop, but she remains keenly interested in the problem it tackled—especially the need to clarify what’s influencing what. 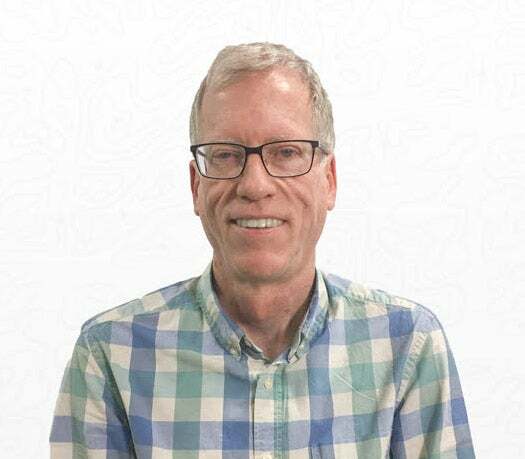 “I am very interested in using causality theory to try and see if we can extract more information from the observations,” said Barnes in an email. “I think we still have a long way to go before we can confidently make statements about the link between Arctic temperatures and the midlatitude weather we observe, and I think this might be a way to attack the problem. Winter isn’t the only season where scientists are hunting for links between climate change and weird weather. 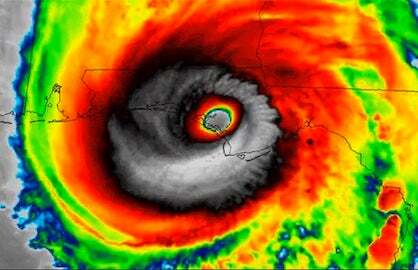 Some fascinating work has emerged lately on extreme summertime weather events and human-produced global warming. We’ll cover that topic in an upcoming post.